BLUEBERRY CRUMBLE It’s the final installment of our countdown to the day when our obsession is made manifest all across the nation. Being the devoted grillers that we are, we must up the ante by grilling all the way through the menu. Time for dessert. My wife Barbara has a passion for the tiny, sweet, incredibly fragrant low bush blueberries harvested in Maine at the end of July and the beginning of August. Mine, of course, is the grill. Now, marriage is a study in the art of compromise, so I created a blueberry crumble that would satisfy Barbara’s passion for blueberries and mine for live fire cooking. A gentle whiff of wood smoke brings out the delicate flavor of the blueberries. 1. Pick through the blueberries, removing any stems, leaves, or bruised berries. Mrs. Raichlen would rinse and drain them–I don’t bother. Place the berries in a large nonreactive mixing bowl. Add 1/4 cup of the flour and the granulated sugar, lemon zest, and lemon juice and gently toss to mix. 2. Spoon the blueberry mixture into the aluminum foil pan after lightly spraying it with cooking oil. Place the biscotti, brown sugar, and the remaining 1/2 cup of flour in a food processor fitted with the metal blade and process until a coarse powder forms. Add the butter and salt, then pulse until the mixture is coarse and crumbly. Spoon the topping over the blueberry filling. 3. Set up the grill for indirect grilling and preheat to medium-high. If using a gas grill, place all of the wood chips or chunks in the smoker box or in a smoker pouch and run the grill on high until you see smoke, then reduce the heat to medium-high. If using a charcoal grill, preheat it to medium-high, then toss all of the wood chips or chunks on the coals. 4. When ready to cook, place the pan with the blueberries in the center of the hot grate, away from the heat, and cover the grill. Cook the crumble until the filling is bubbling and the topping is browned, about 40 minutes. 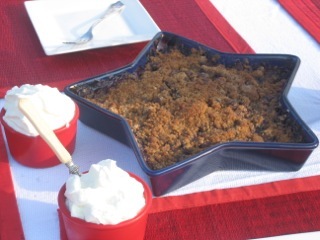 Serve the crumble hot or warm, ideally with vanilla ice cream.